This is really cool, because it shows a lot of the new features of SharePoint 2013… It’s an Updated Wheel! Store, sync and share your content > SkyDrive Pro! Keep everyone on the same page > Co-Authoring, Versioning, Team Sites, Site Mailboxes. Make informed Decisions > Business intelligence. 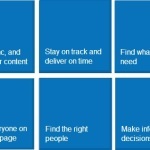 However, in SharePoint 2007 and 2010, the 6 pillars of SharePoint where in a wheel… does the wheel stay the same? Does the wheel change? 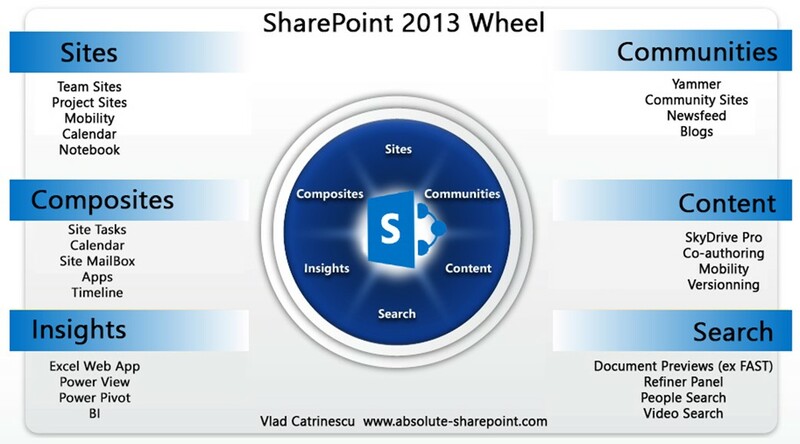 I am not sure, however here is my version of the SharePoint 2013 Wheel. I would love to have some feedback from you on how we can make it better! At the core, the site is designed around the Business Units in every company. This is good because for once, it’s not only IT stuff. People from Sales, RH, Finance and Legal finally find their place and find content that is directly related to them. 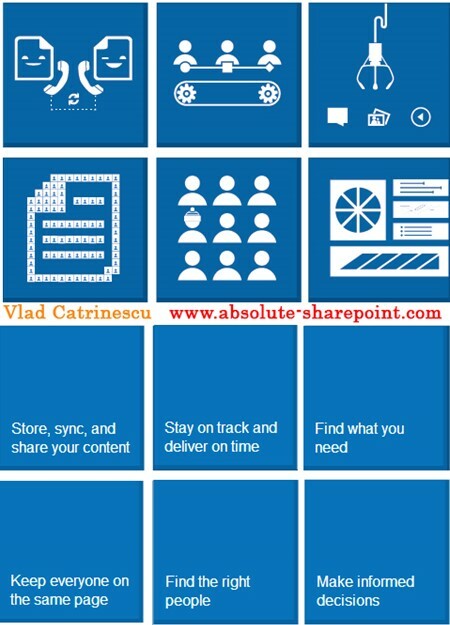 This will help boost SharePoint adoption and demand directly from the Business Units, and not from the IT Department. This will create a lot more successful deployments. For example, check out the slide aimed at “Legal”. It talks directly about what hurts them, and proving that SharePoint is the solution to all their problems. Downloadable Material and SIMPLE videos. On the site, you also find simple videos that show off the really cool collaboration features included in SharePoint Server 2013. Such as Co-authoring and SkyDrive Pro. You can also download the Use Case Catalog and the Adoption Kit. The Use case Catalog is basically the site, in a PDF document. However, the adoption kit is really interesting (and it includes the Use Case Catalog). Adoption of new technologies at work, like SharePoint, won’t happen all at once. In this paper, learn how to craft an effective plan, aligned with business goals, that will demonstrate how SharePoint will benefit business people personally, how it will make their job easier, and how it will address the pain points they experience at work. By taking a planned, phased approach, you can ensure successful adoption by using the best practices obtained by the SharePoint User Adoption Research from Microsoft, and from customers and partners who are successful at driving SharePoint adoption. The Use Case How to Videos are videos that show off the “6 Squares of the wheel “that you saw earlier in my post. They are pretty interesting, and they go well with the Use Case How to Guides, which are kind of the PDF version. The Use Case Catalog is the same DiscoverSharePoint.PDF file you can simply download by clicking the “Get the Use Case Catalog” link instead of the Adoption Kit. And Finally, the Discover_SharePoint_Content.xlsx is a resume of what’s in the other folders J. 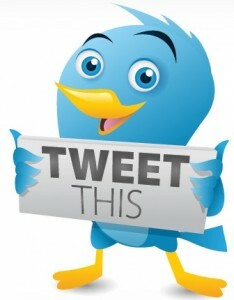 Before you go exploring discoversharepoint.com, make sure you share this blog post with your followers by clicking the little bird right under this line! It’s really Appreciated! Yes, I’ve noticed an increase in SharePoint advertising lately too. I look forward to finding videos that will be of interest and benefit to our executives, business users and end users. Hey, check out the blog monday morning, I got something that will interests you!